Hello! How are you today?! I have to say, I've really taken to working from home. After 12 years of working in an office, there's a lot to be said for sitting at my laptop in chunky knit socks and messy undone hair! Of course, working from home depends very much on the environment. 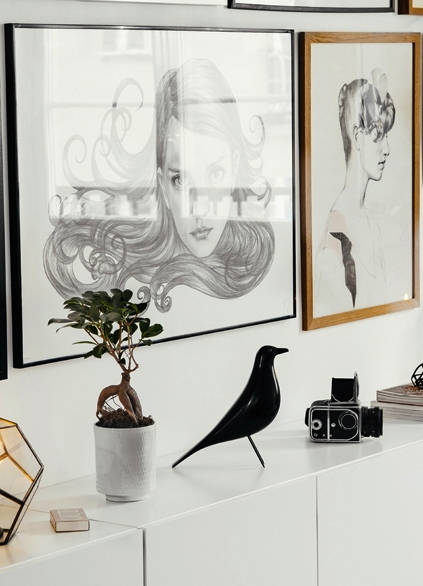 For example, imagine working from home in this apartment of Swedish photographer Jakob Nylund (previously shown here) over looking the rooftops of Södermalm, Stockholm? 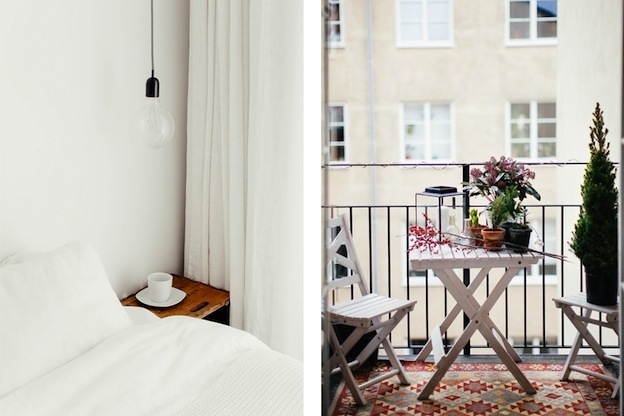 Calm, personal, monochrome (love the black floor, how about you?) 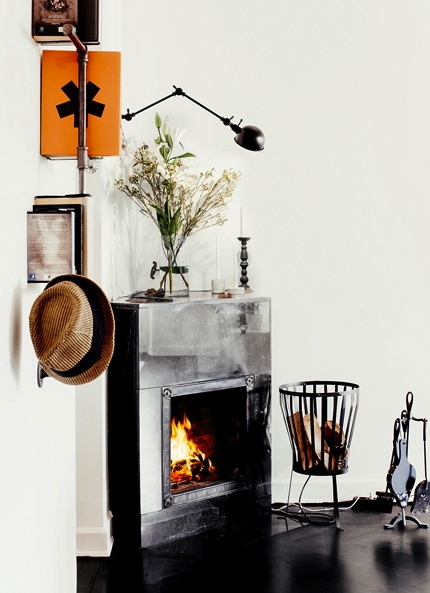 with industrial and vintage touches, not to mention the roaring log fire. I could feel inspired here, could you?! The apartment is currently for sale here). Hurry! 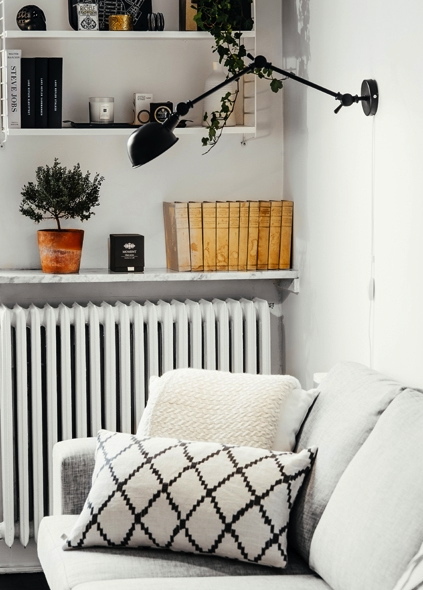 Fab ideas to steal - vintage crate as bedside table, anglepoise style wall lights, string shelving, Eames House Bird, Eames DSW chair, copper pendant lights. Smeg fridge. 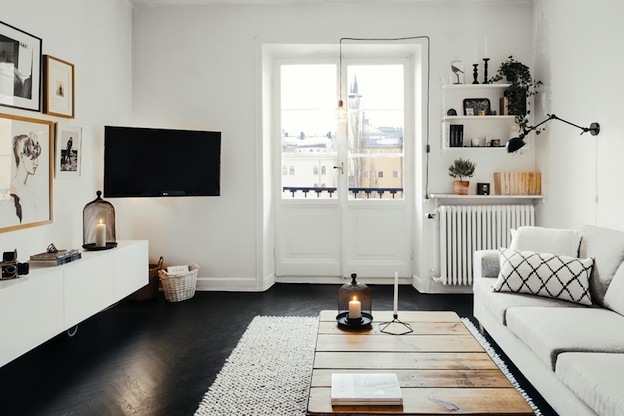 More black and white home inspiration include one of favourite apartments of all time owned by a creative duo, this fab Helsinki home starring a very cute baby and the cool home of Annie Lindgren. 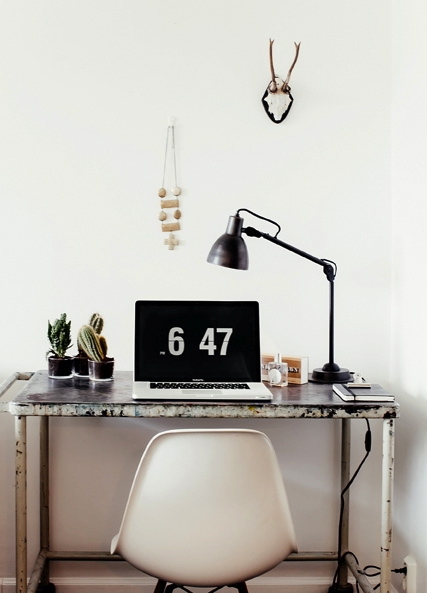 There's always this office inspiration for anyone who feels like they need to pep up their work space, or this studio for something bright and fabulous. It's nearly the weekend - woohoo! Any great plans? This one is particularly exciting as I've teamed up with Nest.co.uk, a fab modern design store, to hold a very exciting weekend give-away. Watch this space! 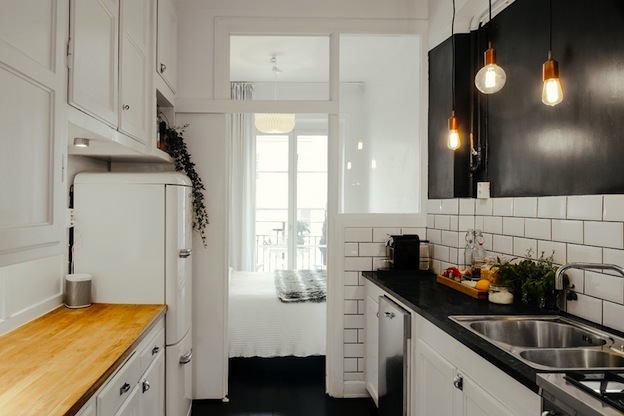 I love the black floor in particular! 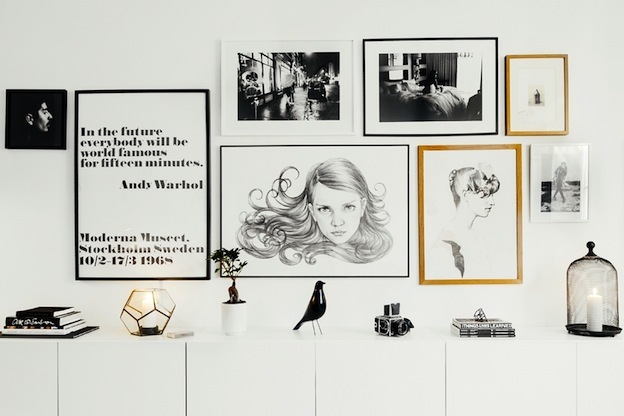 The apartment belongs to Swedish photographer Jakob Nylund, you can see more here: http://blog.formconspiracy.se/?p=6047. Love it! Awful! No colour and so much horrible white bleaching everything out. And then the black as well? Oh no!! Not something I would be comfortable living with at all. Not my idea of comfort or style at all, sorry. Oh, i love the black floor! Yes please! I could work from here any day of the week. I looooove that black floor!